Introducing the full brother to Licensed stallion & Badminton Young Horse Champion Larkshill Debonair & Premium graded and BEF Elite mare Larkshill Supremacy! We are thrilled with this colt and hope he will follow in his big brother's footsteps! Devotion is charming, charismatic with presence and tremendous uphill tendency. A beautiful type with an exceptional neck and conformation. He has swing, elasticity, and a wonderful hind leg. This colt boasts outstanding genetics, along with movie star looks, complimented by exceptional movement - his future is very exciting! In 2008 De Niro was named the Hanoverian Stallion of the year on the basis of his exceptional quality of his offspring and his influence on breeding. De Niro is a legendary sire due to his outstanding movement, extremely high 'rideability' and beautiful type. De Niro was Reserve Champion Performance Test scoring 9s in all three gaits and was awarded the highest scores for 'rideability' (9,67). At 7 De Niro was already succeeding at Grand Prix. In 2001 he was Dressage Champion at the German Championships. In 2002 he was the winner of the international Grand Prix and Grand Prix Special and in 2003 he was the winner of the German Dressage Derby in Hamburg. De Niro's sire, Donnerhall, held the highest dressage breeding value index of all stallions. De Niro's dam was a successful dressage competitor producing an approved stallion in Westfalia. His dam's sire, Akzent II, is regarded as one of the best sires for producing 'rideability' in modern sport horse breeding, and has produced many approved stallions and expensive auction horses. De Niro has already produced more than 60 approved sons. 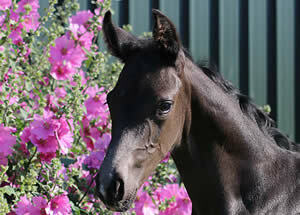 His foals are consistently of an elegant, modern type, showing excellent conformation as well as outstanding movement. His first foal crop got an overall mark of 9 by the Oldenburg commission, and based on the exceptional quality of his foals De Niro received the "Hauptpraemiensieger" (Main Premium Champion) award in 1997. His offspring are extremely popular all over the world, consistently reaching top prices at auctions. Show Hit is a truly sensational mare. She is a State Premium and Elite mare and is mother of Oldenburg and BWBS Licensed Stallion Larkshill Debonair who was also Badminton Young Horse Champion, following in the footsteps of previous winners Valegro and Woodlander Farouche. She comes from three generations of State Premium mares. Show Hit was awarded her State Premium title at the prestigious Elite mare show in Münster-Handorf where she competed against 80 mares selected from throughout Germany. She was awarded outstanding marks for her conformation, movement and type. In 2014 she was awarded Elite Status by the Oldenburg Verband on the basis of her exceptional offspring. In 2008 Carl Hester named Show Hit the 2008 Reserve Champion Dressage Broodmare at the BEF Elite Championship Show. 5 of her Oldenburg foals have all been awarded the coveted Oldenburg Foal Premium. Her first foal Larkshill Riaza was graded with a Verband Premium with the Westfalian Verband. Her daughter Larkshill Supremacy was BEF Elite and Champion Foal and Oldenburg Premium graded as a 3 year old. Show Hit was one of only 100 mares worldwide to be approved to be bred to the Dressage sensation Moorlands Totilas. Show Hit is from one of the oldest and most successful dam lines in Westfalian breeding. From this mother line came the great stallions Grunhorn I, II and III and more recently, from her grand dam St.Pr.St. Fontaene came the very successful Sattelkorung winner, the Riccione son, Rittmeister. With a strong and convincing dam line of her own through Potsdam and Faschingsprinz the mother brings the best of old and new. Her sire Show Star is a Premium Stallion, he became vice Champion riding horse at the Oldenburg State Championships in Rastede as a 3 year old. He went on to be the Champion at the German Federal Bundeschampionate as a 3 year old scoring two times a 10 from the test riders & Vice Champion as a 4 year old. Sandro Hit of course needs no introduction - he is already writing sporting and breeding history!